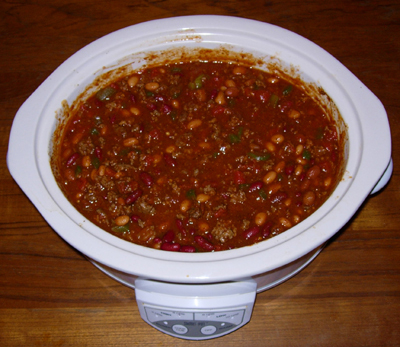 For a few years, I’ve been making Wendy’s Wendy’s Chili, my crockpot variation of a recipe that is similar to the chili served at Wendy’s fast food restaurants. The recipe relied on canned beans, tomatoes and green chilies. Since I had a stock of fresh tomatoes, tomatillos and hot chili peppers, I used those for my latest batch. Wendy’s Uncanny Crockpot Chili was great! I simmered the beans for a half hour and then let them soak for two hours before adding them to the crockpot. I diced 8 medium tomatoes, 10 small tomatillos, two green peppers and four hot peppers. I toasted and ground cumin seed fresh for the batch and added standard chili powder, smoked paprika, salt and pepper. I would have put in onion but I didn’t have any handy from my CSA and hadn’t made it to the farmers market the past two weekends. The result was great chili without any cans in the trash or worries about BPA in the can lining. I didn’t have any local grassfed beef, but I used Moran’s Natural Beef from the grocery store. You are making me hungry. I was thinking about chili this evening . . . or black beans and rice. Hmm . . . Sounds absolutely delicious, and looks great. Got my taste buds going for sure Happy WW.